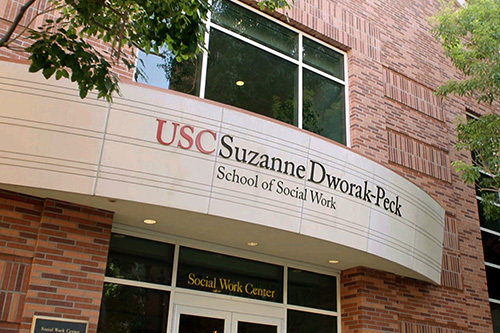 I am honored to serve as the inaugural Associate Dean of Diversity, Equity, and Inclusion (DEI) at the USC Suzanne Dworak-Peck School of Social Work. My school and university experiences as chair of the school’s DEI Committee and university’s Diversity Liaison have provided me with many opportunities to listen and learn from faculty, students, staff, and alumni. As a result, I’ve become aware of the cross-cutting themes that recur across all four constituency groups and the need for DEI leadership development, coordination of DEI-related activities, resource development, DEI targeted initiatives, a climate survey, and DEI operational support. Through trainings, workshops, and dialogue sessions, I have also learned that listening, empathy, allies, and intentional actions are critical to building a more diverse, equitable, and inclusive workplace and learning environment. In 2016, Provost Michael Quick challenged the USC community to unite in creating a more diverse, equitable, and inclusive campus. To provide an institutional map for achieving that goal, all 19 academic schools developed a five-year DEI strategic plan. One year after the Provost’s call to action, we started our planning efforts to improve diversity, equity, and inclusion at the school in the context of its mission, vision, and goals. In 2018, the school’s 5-year revised DEI Strategic Plan identified key priorities for intensive work toward new or renewed goals related to diversity, equity, and inclusion. While there is much to be done, I am excited about the positive steps we have taken. Among its most significant first year achievements, the school developed a required Diversity, Social Justice, and Cultural Competence course for MSW students (SOWK 630). In addition, each department formed a DEI Committee and appointed a DEI leadership team, our governance councils are focusing on related topics, and the school established a new Office of Diversity, Equity, and Inclusion (ODEI) to serve as an organizational hub and support center for our various units and constituencies. Get involved with DEI initiatives and events in your respective department/unit. Diversity, equity, and inclusion across our multiple social identities benefit our entire community. When we work and learn with people who are different from us, we are more likely to solve problems creatively, enhance our critical thinking skills, and develop our strengths as teachers, as researchers, as administrators, as colleagues, and as learners. Because social work is rooted in the pursuit of social justice, we include this value in all that we do. Faculty, staff, and students who engage in diversity, equity, and inclusion work are actively enacting multisystemic social justice and change. Cultivate awareness, allyship, and action through programming and research. Create collaborative partnerships with departments/units and campus members to advance DEI work and to promote dialogue on DEI related topics, professional development, and social change. Develop a series of Real Talk Forums which include public lectures, symposia and workshops that contribute to school-wide conversations on topics related to diversity, equity and inclusion. Develop a series of DEI Learning Labs for faculty and DEI leaders/practitioners to promote inclusive excellence in teaching and the workplace through the development of innovative instructional methods and best practices in DEI. Develop funding opportunities for DEI initiatives. First, recognize that you play a critical role in helping students talk openly about the historical roots and manifestations of social inequality and discrimination. Second, be reflective of your own racial, ethnic, cultural and unconscious biases. Your experience with diversity, racism, privilege and people of color influence your ability to have these conversations. Third, acknowledge the challenges to changing your frame of reference about race and racism. Learning how to talk about topics such as white privilege, systems of oppression, racism, police violence and mass incarceration takes practice and courage, regardless of how long you have been teaching. Finally, be willing to adapt instructional practices, classroom management, and motivational techniques. Clarify the meaning of race and racism. Acknowledge the fear of offending, discomfort and risk of talking about race. Create a safe space that sets the stage for respectful and honest conversation that is civil and where everyone can voice their views. Focus on the desired outcome of the conversation as well as the process of engaging students in the dialogue. Use stories and metaphors as examples that people can connect with. People ignore data that does not fit their perceptions, but stories are compelling. Telling stories is also an effective way to teach, persuade and even understand ourselves. Talk about structures, policies, practices and norms. Focus on the context in which racial conflict and racism occurs and address the impact it has. People are more likely to engage in a dialogue about institutional racism when there are no accusations or blame directed at them. Focus on shared values such as equality, security, liberty, dignity and respect for others as articulated in the NASW Code of Ethics. Talk about solutions as well as the problems so that people feel there is a way to make a difference and do not feel overwhelmed by the magnitude of the problem. Frame (or reframe) issues to identify what the problem is about and how it can be addressed. Successful framing puts you in a favorable position to direct the discussion and improves the chances of a successful solution. Explore explanations for the disparities. Differences are not always "bad" or “negative.” Help students examine the basis of observed differences. Address blatant racist assertions and give your students and yourself an opportunity to process what was said. Use reflective writing assignments to launch discussion and make sure everyone in the classroom shares their perspective and rationale. Draw from a wide array of materials (i.e., readings, videos, audio clips, images/symbols) to help you deal with what is uncomfortable and unfamiliar in the conversation. What did you appreciate about what was shared? What strengths did you hear? What do you relate to what has been shared? Do not offer advice or ask questions. Just appreciate what was shared. Stay focused on the person who is sharing. If you have a strong response to someone’s story because you relate to it, that’s great! You can share what you are feeling, but be careful not to launch into your own story and lose the connection with the person. You will be able to share your story next, after that person’s resonance time is over.